Use this glossary with the EL Support Lesson Plan: Reading with Symbols. Use these vocabulary cards with the EL Support Lesson Plan: Reading Pictures. Help your child review reading comprehension questions like this with this at-home practice test. Use these vocabulary cards with the EL Support Lesson Plan: Reading with Symbols. Use this quick reading assessment to evaluate your students’ abilities to read compound words, such as sunflower, bookcase, and cowboy. Engage students in reading by having them share about the nonfiction books they read. This activity will get students talking, listening, and writing! Set students up for success when reading nonfiction by having them brainstorm what they already know about a topic. Mastering vowel sounds is an important step on the path to reading! Help students build key reading comprehension skills by creating a story map for a book that they read. Students practice retelling, identifying characters, and making connections. This 1st grade printable board game packs a triple reading punch, improving spelling, expanding vocabulary, and building phonics fluency all at once! 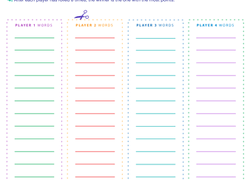 This 1st grade printable game packs reading, spelling, and vocabulary practice into one. Players roll the dice, then spell a word using the letters rolled. Reading is so much more than just following words on a page—it's about deriving meaning from the text! Reading fluency is so much more than just following words on a page—it's about finding meaning and making connections! As students retell stories, have them use symbols to highlight certain parts in their book, such as question marks to note questions and hearts to indicate their favorite parts. It’s easy to get caught up in the excitement of learning how to read. This worksheet has students slow down and reflect on what they’ve learned, as well as what they’d like to work on next.